It’s been awhile since I updated you on my kitchen plans, so today I thought it was high time I share our refined and (finally!) more firm plans! Yippee! I’m super excited to finally feel settled and am very ready to start moving forward on our project. It was so very helpful for me to go through the process of dreaming up all the possibilities and then letting the options sink in (see what I did there?) to see what felt right. As I mentioned before, the main reason we moved here wasn’t to design another house, but rather to more fully live. That perspective helped so much in our decision making process. With our goals and purpose in mind, being intentional about the life we want has really helped me narrow down what we need to do to our house and makes it more clear about what we don’t want to do. Having the chance to design another kitchen is a dream and not a must in the grand scheme of life. Being intentional about designing our life is by far the most important challenge and goal for our family. Because our home and our life are so intertwined, I’m excited that we will have an opportunity to see our vision for our home come to life for our family. We cannot wait to move forward and I could not be more happy with our vision and the design direction! To have contractors stand in our home and confirm the ideas are good ones was so exciting for some reason, I guess I just feel relieved to finally be at this point. Hopefully early this summer our kitchen will be gutted and the remodel will actually begin! I told one contractor that if he could gut it TODAY I’d be thrilled. Keeping my fingers crossed because I’m just SO ready. My goal is to have this kitchen finished by fall one way or another. My timeline isn’t always realistic and I know there are often bumps in the road (take my side yard which is still in process, for instance) but I’m feeling hopeful that we will be moving ahead in the coming weeks and the pace will accelerate. What about the layout, size and style? 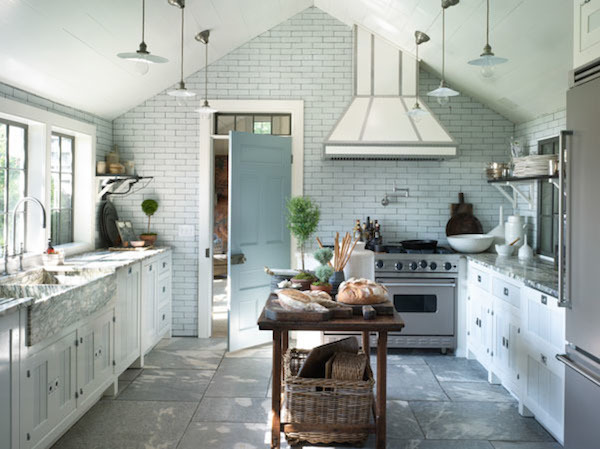 The style of our kitchen will be in keeping with the look we’ve always loved, a more modern traditional style with a coastal farmhouse vibe (at least that’s how I’m thinking of it in my mind!). Our whole house will be receiving a style update over time, so we cannot wait to see the elements we love start to come together! The inspiration images in this post have design elements I really like (some I’ve shared before) and each one has a piece of the puzzle that has inspired an idea, or at least give a bit of the ‘feel’ I’m looking for (not necessarily the exact colors or details). I’ll continue to share more inspiration pics and ideas as we go, certainly the ones in this post are just a fraction of the wonderful ideas that will continue to inspire our design. The key to simplifying the process and cost (with any remodel) is to leave the physical space intact. That means the appliances, plumbing, windows and layout will remain as is, but the space within the walls will be completely gutted and transformed. It is a small kitchen and will happily remain one. I happen to love the ambience of small kitchens so no complaints from me on that. We will simply address how spacious the room feels and functions and its connection to the dining room in other ways. What about the location of the sink? You probably remember my original dream was to place the sink at the back of the house (to take full advantage of the view of the Puget Sound, mountains, and Bainbridge Island) but as we’ve lived here longer we’ve decided that wasn’t as much of a priority as I originally felt it was. It was a splendid idea, to be sure, but there are other simple yet wonderful ways we will transform the kitchen to fit with overall vision and our goals. Besides, the great thing is that we will still have the view from our kitchen sink if we leave the sink where it is (with a quick turn of our head or as we move about the kitchen), but by leaving it where it is we won’t be blinded by the light that streams in the windows in the late afternoon. 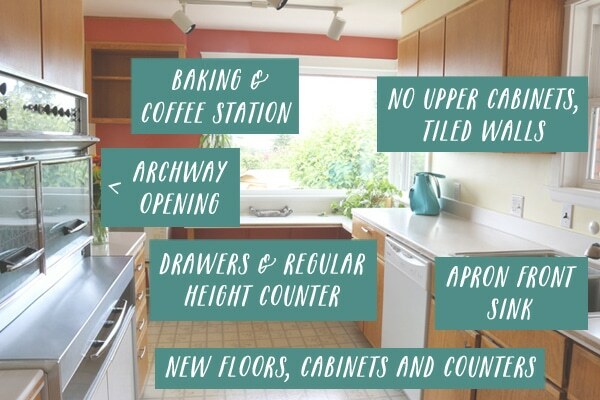 Instead, we will have a new full height counter under the the large window with lots of drawers below, the perfect space for a coffee and baking station! We can enjoy the view from that nice wide and unobstructed countertop any time we want to. What about the upper cabinets? All of the upper cabinets (except around the fridge) will be removed to add to the sense of spaciousness and to give the kitchen a really clean and uncluttered look that I love. When I removed the upper cabinets in our last kitchen I felt like I had to often defend or at least explain my choice but now it’s much more common and acceptable. Even if you still think I’m crazy for removing upper cabinets in a small kitchen, ha, keep in mind we will be adding lots more very functional drawer space so we will not have any less storage than we currently have. 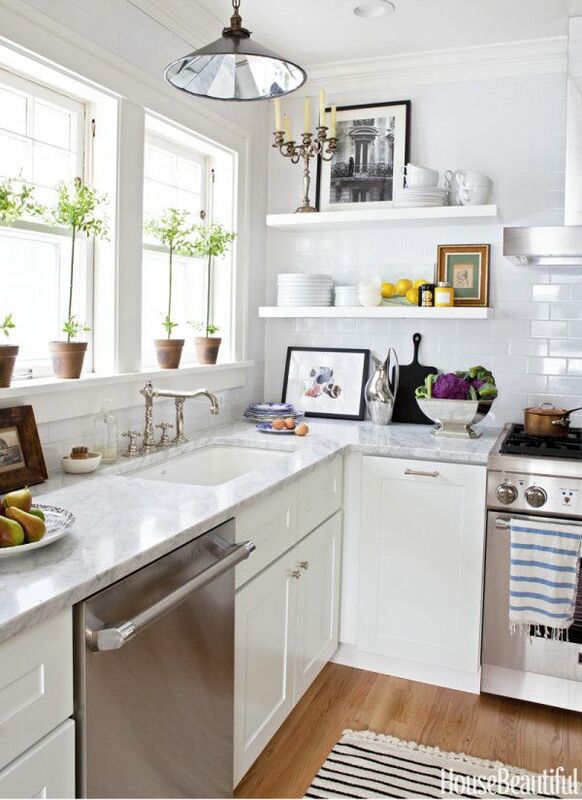 I love how extra spacious countertops feel with no upper cabinets so in a small kitchen that is a big plus for me. 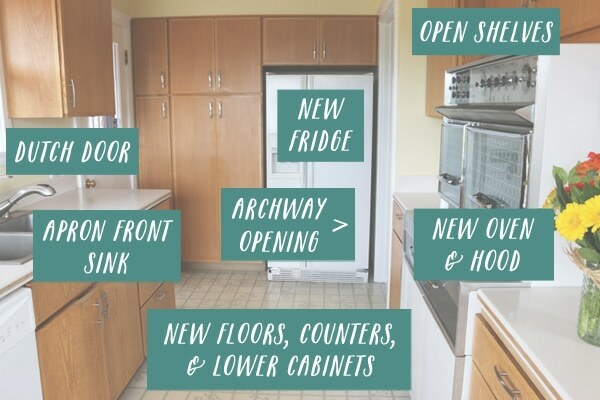 Besides the joy of an entirely fresh and new kitchen, one change I’m super excited about is we’ve finally decided for sure to eliminate both of the small cramped interior doors to the kitchen in favor of wider archways. The arch was an idea we had very early on and just couldn’t stop thinking about. That’s when you know you have a winner of an idea, I guess! And when a contractor took a look and agreed it was doable, it was settled. Arches are so inviting, romantic and charming, don’t you think? We will have a wider archway from the dining room and a narrower one from the entry hall. The change in doorways means three spaces will have more character! It’s a triple win. We will have better traffic flow between rooms and from the back Dutch door to the entry hall, which will make the entire tiled hall nearly as functional as a new mudroom would have been. Hooks for the win! but you can see the painter’s tape we put up a long time ago to help us visualize an arch! The archways will open up the wall to bring more light to both rooms, but still allow us to keep the location of the range wall with counter space on each side and a range hood above it. 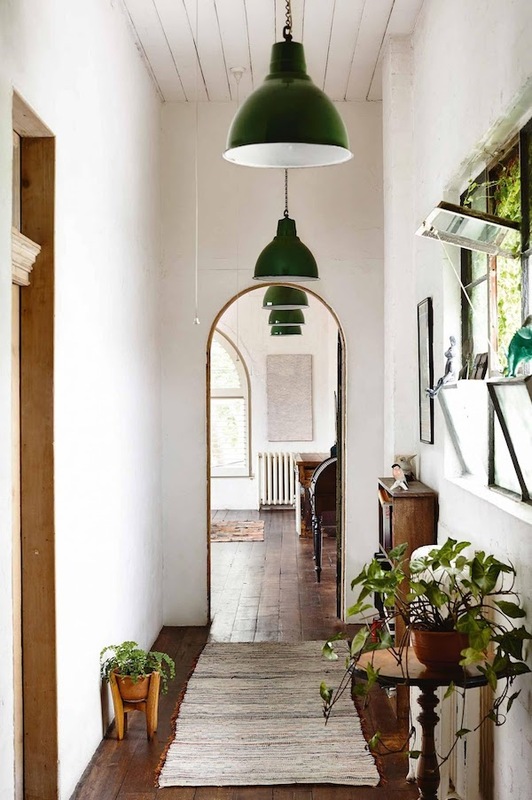 The new arched doorways will also help keep the “messy” areas of cooking in a small kitchen less in view from the dining room and living room than if we removed the walls entirely. That will make holidays and dinner parties much more enjoyable for me. No one really wants to look at the turkey carcass on the stove and all the cookware in the sink during Thanksgiving dinner, right? Problem solved. So, there you have it, the latest plans! So…SO excited to get this rolling and thrilled you are following along. Stay tuned! See more angles of the “before” of our kitchen and catch up on past posts about the kitchen here! i’m living vicariously through your house renovations and cannot wait to see the end product!! love love love!! So exciting! I know the final result will be lovely. Isn’t it wonderful to have time to plan, live in the house, and really think things through! I’m pleased to read that you’ve removed upper cabinets before and will do it again. Kitchens looks so much more open and airy without them! Love all your final plans! You really are a visionary! Great plans and I can’t wait to see the execution take place and the finished job! How exciting! I agree, kitchen remodels are ( the planning and anticipation of the newly remodeled space) is so much fun & exciting. 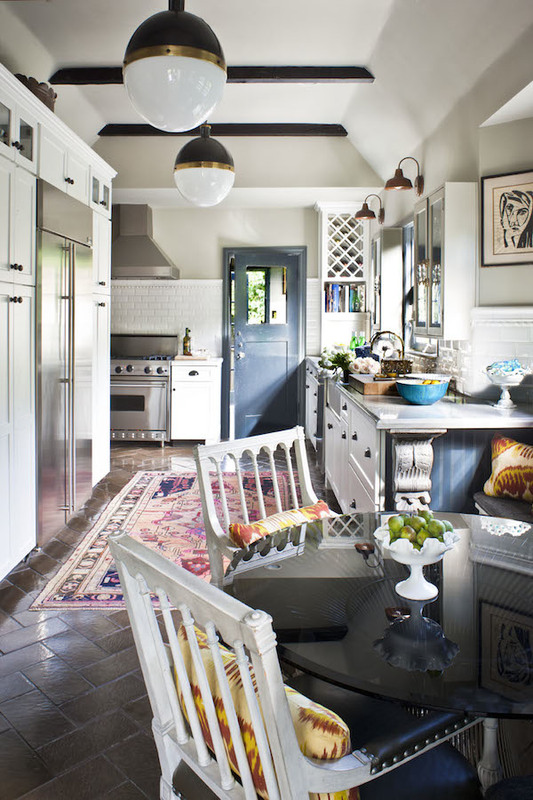 I love smaller, CHARMING, efficiently layed out kitchens over those HUGE ones you often see in McMansions. You’re on your way and so excited & happy for you!! Its all going to be wonderful! Can’t wait to watch it happen. Our kitchen is one big space with our living room, and my only complaint is that on holidays or when we have company, you see all the dirty dishes and mess from cooking, so I understand your desire to keep that hidden! The arches will be great and add a lot of charm! I love your plans for the space! Remodeling a kitchen during the summer grilling season is the best timing! Picnics with paper plates seem natural, not like you’re suffering through an unusable kitchen. I cannot wait to see the transformation. this is so exciting to “watch”! i’m curious, what color are you thinking for the cabinets? the lovely charcoal like your last kitchen”? I am currently planning a kitchen and your last house kitchen is my #1 inspiration. Exciting!! Your plans are wonderful! I love that you can see what works for your home. Open concept is nice, but doesn’t have to be in every home. I laughed out loud when you mentioned “seeing the turkey carcus”… so true! Looking forward watching the transformation!!! Prayers all goes as smoothly as possible. I put large drawers for my bottom cabinets in mykitchen remodel. Have never been happier—-love not having to get down on my knees to look for something in the back of a drawer. However, Ikept the upper cabinets in my truly small kitchen for two reasons. In my 100+ year old house, Ineeded the storage and 2) I could never manage to be neat enough to keep open shelving looking nice; admire those who can. I’m happy that you are keeping the footprint of the kitchen! That makes it a realistic dream. ? Melissa, it was your kitchen that first attracted me to your blog way back in the olden days. I loved the way you made over your last kitchen to be more “you,” and I can’t wait to see how you’ll do the same thing here. You are SO SMART to live in the house a while before tackling this big project, but what fun is ahead! Thank s for sharing it all! My heart is in a bliss state for you, Melissa, with this post. Back when you posted the sketch for a new wide-open floorplan for your living room/dining room/kitchen, it was indeed “grand” but, personally, I don’t like the execution – even the most well done look somewhat like furniture showrooms and my eyes find no place to settle. When you did the post on moving the dining table under that huge window and I looked from the front of your leather couch and saw your vision, I pulled out your wide-open floorplan sketch and I thought: Although she’s not saying it, at some deep level, she must have realized that if she went with that completely open plan, no one’s eye would ever notice that beautiful dining setup by the window – there would be too much visual clutter beyond it. Besides, it just didn’t seem like you. This return to function over form IS you, it’s in keeping with the words in all your books, it’s exciting and I’m so glad to come along for the ride. I think your remodel will be beautiful, but I’m kind of obsessed with your stove/oven! It’s just so space age and futuristic looking! I probably would have done something crazy like remodel around it, if it worked correctly!! What are you doing with it? I had a stove like yours when we moved into our house in 1979. Always have regretted getting rid of it. Mine had a slide out stove top. If I wasn’t clear across the country I would gladly take it off your hands! Hello! You have a great aesthetic and I look forward to all your changes and selections. I have questions that you may help me with since I plan to start my kitchen remodel this year (hopefully). When you talk to the contractors, do you give them any specific data/list/layouts that help them come up with an estimate or do you just talk about the project informally? I know each remodel has different needs and goals but perhaps you can share what you did. I found that with our last bathroom remodel, we gave each of them the same information but it was still hard to compare the resulting estimates. We finally went with the contractor that we thought had interacted with us the best. Since you have done this before, I hope you can share your process and insights for us newbies. Love where you are headed and am enjoying your ride. We are also on a huge renovation journey currently, although I’m setting the major kitchen renovation aside for a later date. It’s fully functional and not unattractive so I’d rather live with it for a while like you did and see what has to be changed. I am going to tweak it a little, adding lights and expanding the island just a little for a garbage pull out. It just makes sense to do those things now. Oh, and I forgot to add that I truly love the arch details! I have several in my current house, one in the kitchen even and I feel like they give the home so much character. Definitely a key element to setting your kitchen apart! Yay! Thank you, I agree I think they do add a distinction to a home’s look! My kitchen gut/reno starts on May 31 and I’m super excited! We are losing our “eat-in” kitchen for a larger footprint. We are removing part of one wall, moving the sink location and having gas run to the kitchen for our dream gas cooktop. I went back and forth on the upper cabinet idea, but ultimately decided to have them because we have very high ceilings and the room would feel empty without upper cabinets. For lower cabinets I have chosen mostly drawers vs cabinets with doors. I think drawers are so much easier to get in/out of unless you install drawer type sliders inside the lower cabinets. 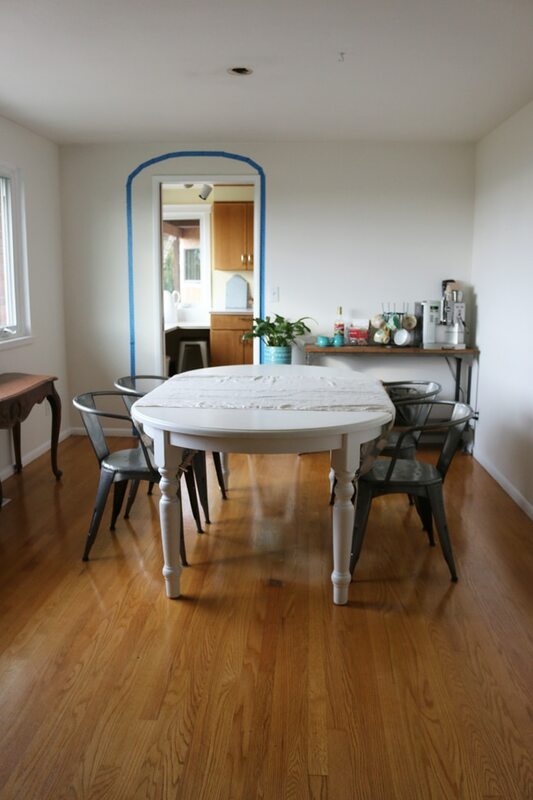 Our kitchen has no windows, and only has a double french door on one end – so I’ve gone with a lighter color scheme similar to the first two pics you have.We will no longer have a “formal” dining area, but rather an every day dining area that will accommodate up to 12 people if needed. We have been thinking about this for over 2 years and are finally going forward. I still have some decisions to make – yeah – I have to get busy – pendant lights and cabinet pulls are left to choose – eek! Sorry for my long post…I’m a little bit excited !!!! A new kitchen is SO exciting!!! I’m happy for you and am sure you are going to love it! Very inspiring! Can’t wait to see the results. Would you consider making the arch larger? Looks like you have room on the left side. Thanks! Yes, that was just our shape mock-up. We have consulted with a contractor on how big we can make it, we’ll make it as big as we can without interfering with the cabinets in the kitchen! I’m new here but so excited to see this through with you! 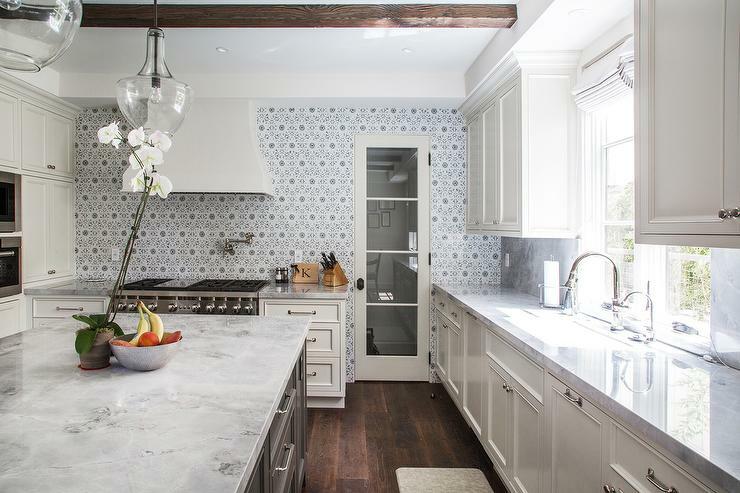 There is nothing I love more than kitchens – so I’m going to pop over to your former kitchen reveal so I can see what your last one looked like. Your inspiration images were all very pretty but I especially loved that one from Seagrove Homes – isn’t their work amazing??!! Welcome! I’m so glad you are here. I LOVE kitchens, too, so I’m excited to share this adventure. Yes, that kitchen is amazing! I have to say thank you for your blog. I found it 3 weeks ago while looking for inspiration for a home we just bought that looks like it did the day it was built. That being said with the exception of new windows which are a necessity and a remodel of the only bathroom due to water damage, we have decided to live in the house before doing any remodeling of the kitchen. many think we are crazy but kitchen remodels can be expensive, want to get it just right. 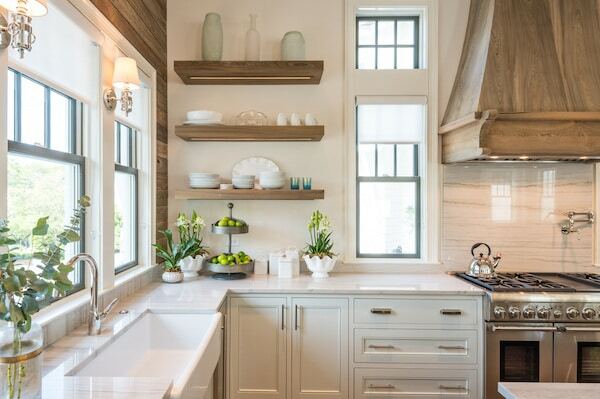 I love the open shelve idea, I am only 5’4″ so the top shelf in cabinets are wasted. Also after having drawers in our last kitchen, I will definitely be using them again. They make it so there is no lost space in a kitchen. I am so looking forward to future readings of your blog. Thank you. Hi Kathe! Nice to meet you :). I’m so glad you found me here and I’m excited you’ll be following along. I’m only 5’2 so I agree, the top shelf is problematic! :) You are so right to be patient with your plans, you’ll discover so many things about your home as you live there that may alter your choices! Thanks for commenting and introducing yourself!